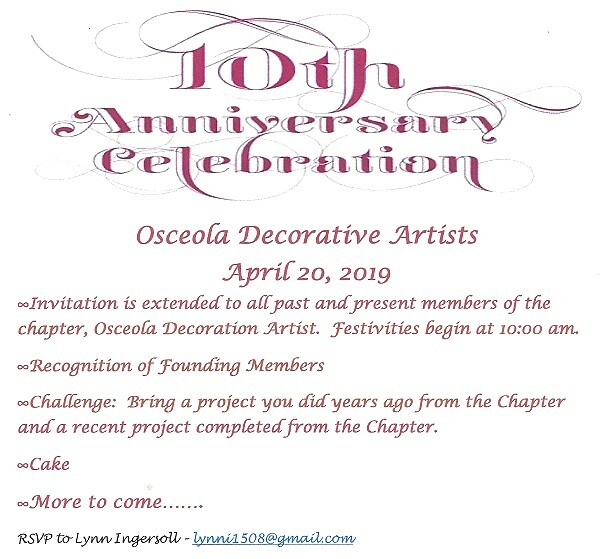 Welcome to the Osceola Decorative Artists website. We are a painting chapter, receiving our charter in 2009. Our meetings are held in the heart of Florida --the Kissimmee/St.Cloud area. We meet monthly with a short business meeting followed by a painting workshop. In addition to workshops, we strive to provide members and guests with two weekend seminars each year. Our members are a mix of beginners, intermediates and those who seem to make their brushes effortlessly dance across a surface. Mediums of choice run the gamut — oils, colored pencil, acrylic, watercolor, silk painting and more. We participate in community outreach, sharing with others through art and community service. Our members offer a variety of backgrounds and a wealth of talent. We invite you to browse our website and encourage you to join us in our painting community in beautiful, sunny Florida!